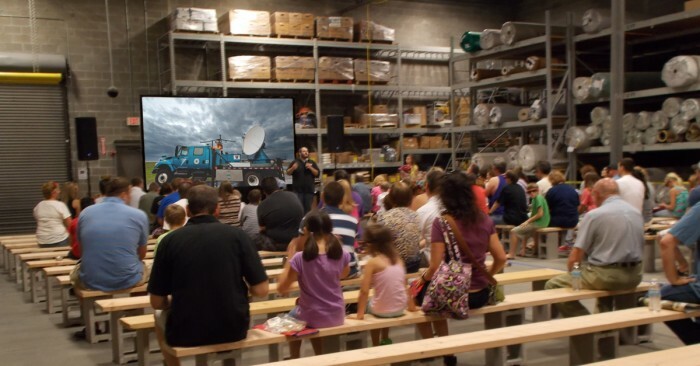 Giant Screen Films and D3D Cinema are on a mission to educate. This is not your typical scholarly pursuit, however, as their goal involves traveling to remote regions and helping to empower and inspire young people in communities affected by a tornado’s destructive power. Luckily, this group brings extraordinary tools to the task at hand, including a nationally-recognized storm-chasing specialist, some of the world’s leading tornado researchers, steel-clad custom weather vehicles and a 10,000 lumen, remarkably rugged DPI projector. The project is supported by a National Science Foundation grant, awarded to produce a film titled Tornado Alley. The documentary features filmmaker Sean Casey, star of the television series Storm Chasers, and the researchers of VORTEX2, the most ambitious tornado research mission ever undertaken, in their attempts to collect footage and unprecedented data from the heart of a tornado. Enlisting a mobile Doppler radar station, a number of custom-built vehicular juggernauts fortified to withstand remarkable winds and debris, and custom-created weather measurement devices, the group patrols the traditional ‘tornado alley’ of the central U.S. in search of the perfect storm. 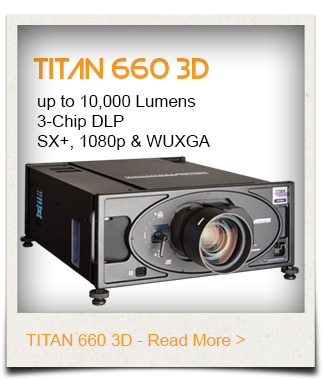 The mobile experience includes one of the fortified vehicles, advanced weather measurement devices, key personnel from the film and a staging-grade TITAN dual-lamp 1080p 3D projector from Digital Projection International (DPI). During these presentations, an abbreviated version of the 3D film is shown, followed by insight and discussion. “At sites that are underserved or in the process of recovery from a weather event, traditional classroom tools—let alone a film projector—are resources that can’t be taken for granted. In those cases, a 3D film is a special addition to the experience,” explained Raksany. Attendees also get hands-on interaction with the mobile Doppler studio and fortified vehicle.